Our Verdict: Crafted by a real chef with proper culinary training, Vapor Chef offers e-liquid that are refined and tweaked to perfection. While some flavors are hit-and-miss, most are well executed and a refreshing spin on the traditional, cookie-cutter recipes of other e-liquid manufacturers. Described as “warm peanut butter cookies, brown sugar and vanilla,” PB Nomnoms sound more like dessert than e-liquid. But the description is apt because PB Nomnoms tastes just as described. 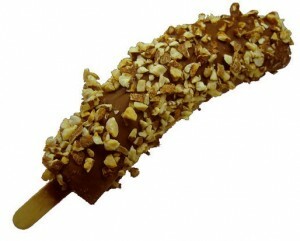 It has a smooth peanut buttery taste, with soft undertones of vanilla and brown sugar. An excellent blend for peanut butter lovers. 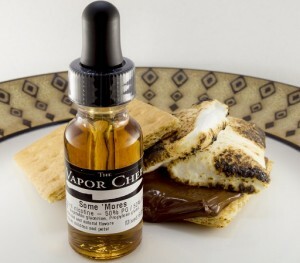 A flavor that attempts to evoke the campfire favorite Some ‘Mores has the strong toast marshmallow taste with a hint of Graham crackers and chocolate. It’s a subtle flavor, though chocolate lovers will have to taste hard to detect the chocolate. Still, it’s an enjoyable vape. 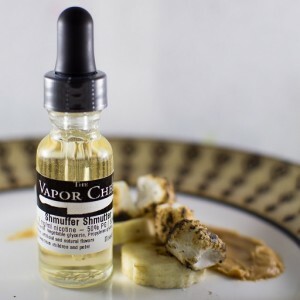 The name does not give a hint of what this flavor is supposed to be, but Vapor Chef’s site describes it as “Peanut butter, bananas, and toasted marshmallows. Enough Said.” Unlike Some ‘Mores, where the toasted marshmallow flavor takes center stage, Shmuffer Schmutter focuses on the interplay of flavors between peanut butter and banana. Highly regarded as one of Vapor Chef’s best flavors, it’s a flavor definitely worth trying. The Slartibartfast is a blend of cherry tobacco that combines the rich taste of tobacco with subtle hints of sweet cherry. For those who’ve smoked cherry pipe tobacco before, this will bring back a flood of memories. One of Vapor Chef’s top flavors, the Funky Monkey is as a mixture of banana, chocolate, nuts, and vanilla. The banana, chocolate, and nut flavors jump at you, jostling for position as you taste the three in a wonderfully complex blend. There is a hint of vanilla of make things even more interesting. Funky Monkey is tasty enough to curb your sweet tooth. Brand: Founded in 2013, the Vapor Chef began its life as a small start-up. The name comes from the fact that its founder, Aras, is an actual chef who shifted careers to focus on mixing e-liquid. As a DIY mixer, Aras was urged by family and friends to start selling his creations, and thus Vapor Chef was born. What makes Vapor Chef stand out as a brand are its unique flavors, constant tweaking and experimentation, and the refined palate of Aras himself, who isn’t afraid to take any chances. The results are highly palatable e-liquid that users the world over tout as being some of the best in the business. Vapor Chef’s selection of flavors is not staggering, but it is large enough to not bore its customers. Besides, the company focuses on quality over quantity, and it does so excellently. Bottles and Flavors: Vapor Chef e-liquid comes elegantly packaged in simple yet stylish bottles. Labels are minimalistic yet stylish, with a black and white kitchen knife logo that reminds users how expertly made its flavors are. Bottles come either in plastic or glass, depending on what size one orders. The 6ml and 15ml bottles are plastic with standard dripping nozzles, while the 30ml and 60ml bottles come in glass ones with a dedicated fine-tipped dripper. Both plastic and glass bottles are of high quality, and look sturdy enough to survive transport in one’s pocket or purse. 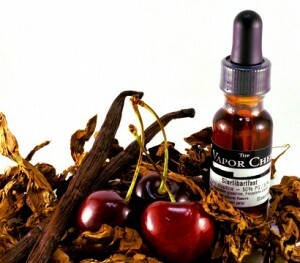 Vapor Chef e-liquid come standard in a 50/50 VG/PG ratio. However, users have the option to choose 70/30 or 30/70 VG/PG ratios. For flavor seekers and cloud chasers, they can also opt to get max PG or max VG options. These mixing options are enough to satisfy any vaper’s tastes. Nicotine levels, on the other hand, are available at 0mg, 6mg, 12mg, 18mg, and 24mg. It would have been better if the company offered levels up to 36mg to cater to heavy smokers who are just trying vaping. Still, the range of nicotine levels is wide enough to suit most vapers. The flavor groups represented in Vapor Chef’s selection is well represented. The menu has flavors ranging from tobacco to fruity, sweet to complex, and various blends that mix and match several, or all, the groups. As for vapor production, it depends on what PG/VG ratio users choose. More PG means more flavor but less vapor, while more VG has less flavor and more vapor. The vapor quality of Vapor Chef e-liquid depends on this choice, but even so, their 50/50 ratio e-liquid provides great flavor and decent vapor production to appease most vapers. Aside from the excellent flavors and tasteful quality packaging of Vapor Chef e-liquid, the company also boasts its stringent quality control and use of high-grade ingredients. PG and VG are USP-certified while the nicotine-based liquid is US-made. Furthermore, they ensure that all their offering are dactyl, acetoin, and acetyl propionyl free. Flavors are tested by Aras himself, his friends and family, as well as select customers and users to ensure only the best blend of flavors are released. Finally, all products are mixed and shipped out within three days to ensure freshness. It is clear that Vapor Chef values quality above anything else.